A few years ago, Karen Baddley (formerly Outten) launched a Gundog League for agility dogs belonging to the Kennel Club Sporting Dog group. These dogs were originally trained to find live game and/or to retrieve game that had been shot and wounded. They make good companions, with very easy going temperaments. And they are not bad at agility either! The Gundog Agility League is now into its 11th year and we are hoping for more years to come our basis has always been to promote Gundog breeds and their crosses competing in agility and we hope that we still continue to do that. The League is open to any gundog breed as per the Kennel Club breed list, but we are not asking that the gundog needs to have an actual pedigree papers as we know many come via rescue centers, We also have a Gundog X league where all we ask is that the dog is part gundog breed. The League is open to all heights including dogs competing at standard height & can compete in KC shows, UKA or other unaffiliated shows. Our points systems works via on-line claims accessed via our web site www.gundog-agility.co.uk but we also accept postal claims as well, we also have an active Face Book page. Entries are now being taken for 2015. Looking back over 2013, The Gundog Agility League had a very active year with new members joining the long-established League for Gundogs and their crosses. The idea for 2013-2014 is to reach more Gundog owners to offer them a variety of different ways to join together via a range of smaller Gundog Agility Leagues for handlers who may not compete at many, if any, Kennel Club shows, due height restrictions. UKA Standard, for instance, is a height that many of the heavier framed Gundogs find more comfortable. These smaller Show Series Leagues are to offer a way of an incentive to become more competitive in a more local way. Further to this idea, Gundog Agility have teamed up with UK Agility to provide an annual Gundog League for UKA members. The League will run throughout the year at all UKA shows, offering a range of heights including Standard. We hope this Leaguee will help fill the gap of Handlers who do not do KC shows. So far the take up on this League has been very encouraging with 76 handlers active on the League tables. We would like to extend the Smaller League into Scotland so if anyone is interested in helping put together a Show Series League, then please contact us. The final 2013 results can be seen below. The Gundog League is planning to hold its annual show on 9 February 2014. The schedule will be available soon. The Gundog League is just over have way through its current 2013 League season. It has been very active with a current membership of 150 dogs of which 124 have submitted points so far towards the Annual League awards that run from 1 January 1 to 31 December 2013. There are a wide range of Gundog breeds competing in KC, UKA and other Independent Agility groups. There has been a noticeable breed swing this year with the rise in Working Cockers now competing in agility - they mostly tend to be Medium height dogs as Small Cockers are still in the minority. The Gundog Agility League is pleased to announce that with the association of three Independent agility groups it will introduce and sponsor three new Leagues. The purpose of these Leagues is to help support agility organisations that offer a wider range of jump heights at their agility shows. These height ranges are very important to some of our Gundog breeds. Some of these breeds will never compete at normal KC events due to the limitation of the lower jump height option. It was due to feed back that we have had from members that we felt we would like to offer support to both our handlers and organisations by offering Gundog Leagues over a series of winter shows to encourage more Gundog handlers to support these shows over the winter months. The Gundog League has further developed the Independent show League by offering to run and sponsor a UK Agility Gundog League that will run from the 1 October 2013 until 30 September 2014. This League will offer Gundog handlers that mainly attend UKA shows the opportunity to collect points from one organisation across all of UKA shows. These awards will be presented at the UKA Grand Finals in December 2014. The League is also looking into what it can do in Scotland for a show series League as again they are limited to number of shows and find the full League does not provide a fair chance of gaining an award. The League is here to help promote Gundogs in agility to join our full League please visit our web site for details. Your dogs does not need to have full pedigree papers but be a known Gundog breed of the Kennel Club breed list. Gundog crosses are welcome too. We hold training days and an annual agility show. The Annual Awards Agility Show was held on 3 February to present the 2012 winners with their awards and rosettes. It also provided an opportunity for many League members to meet up and compete in their agility competition. The show is also open to non Gundogs but provides separate awards for Gun dogs and non-Gundogs ABGs. A total of 79 gundogs entered the show this year covering a wide range of breeds and seven heights. The League would like to give a big thank you to its 2012 Sponsors Tony Wild Camping & CSJ Specialist Canine Feeds for providing our trophies and rosettes. The awards presentation will take place on Sunday, 3 February at the Gundog Agility Annual Awards Show at: Kingswood Equestrian Centre, Near Albrighton, Staffordshire. WV7 3AH. After the show, any uncollected Awards and Rosettes will be posted. Membership is now due for 2013. New members are welcome. The Gundog Agility League 2012 Awards closes on the 31st December 2012. All points need to be added to the league tables by 5th January 2013. No points for 2012 will be accepted after this date. 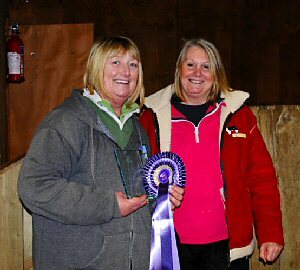 The Awards presentation is taking place at the Gundog Agility Show on the 3rd February 2013 at Kingswood Equestrian Centre, Albrighton. Show entries limit has not been reached so the closing date for the Gundog Agility Show being held on the 3rd February at Kingswood Equestrian Centre, Albrighton is being extended to Friday. 25 January 2013. Sue and Kim Taylor are pleased to announce to Gundog League Members that they will be providing an overall Best English Springer Spaniel and runner up, trophy/rosette for the 2012 season and, initially, the following four years. This sponsored trophy and special rosette will be presented at the Annual Gundog show. This is in memory of all their Spaniels, now passed over the rainbow bridge, who provided much fun and laughter during their lifetimes. Sue & Kim are also sponsoring a special Gundog Award trophy/rosette and runner up at Dogs in Need for the Overall Best Gundog at this show. Points will be calculated for those dogs winning a Best Gundog in Class rosette in all individual classes across all grades/heights. The table will be posted each evening in the Results Cabin. It is the handler's responsibility to advise Pads/Scoreboard of Gundog eligibility in all classes. This is in recognition of the exceptional perseverance and patience required by all those who compete with their Gundogs and in memory of their first agility Spaniel, who gave them the agility bug, Jasper. From now on you will be able to claim additional points for special Gundog Awards offered by shows as long as it is detailed on the show schedule. The League has organised three agility training days for Gun Dogs with two top trainers - Nicola Garrett and Ian Dobison, that will be geared towards Gun Dogs that are near competing or are competing in agility. It will be open to all heights and will be offered in the first instance to Gundog League members and their Gun Dogs or Gun Dog Crosses. If places are not filled then they will be offered to non-members. The training days have been split across different venues to enable more Gundog League members to get the chance of meeting up with other League members. The training days are being held at two summer shows with the kind permission of Jackie Kenny from Dog Vegas and Rachel Rogers from Touch Agility Group (TAG). Lydia Critchlow from Dig It Dogs, has also supported the League with the use of their venue. These training days will be non-profit making and discount is being given to members. Non-members will pay full price. The training session will be three hours long with a light refreshment break available outside on grass. Quality equipment will be used to full KC specifications. Only run 1 dog per session may be run so as to keep the flow of the training for all concerned. The course sizes are being kept small - only seven places per session. Two of the training days will be held at agility shows on their rest days so the hope is that perhaps you may combine the training and the show, but you do not need to attend the show to enter the training day. Course information and application forms are available from Aljeana Baddley. CSJ have offered and are delighted to sponsor the Gundog League for 2012/2013. They are also kindly sponsoring the League rosettes and providing CSJ food for the winners, which, no doubt will be much appreciated since so many agility Gundogs are already fed on CSJ food. The League holds an agility show in February each year to which members from all over the UK travel to and are also planning agility training days over the winter of 2012/2013 for League members. Karen & Aljeana wish to thank Ceri from CSJ very much for this sponsorship. The Gundog Agility League is open to all KC acknowledged pedigree gun dog breeds with or without a formal set of pedigree paper so rescue gun dogs are more than welcome to join the full section of the league. We started last year a league for gundog crosses such as Sprockers. The aim of the League has been to promote Gundogs doing agility. We have our own logo that can be added to clothing of your choice and we also have a range of clothing available via either Waggitts or Agilitywear. We run at least one agility show a year which many of our members attend to support the annual awards presentation. The League has it's own web site www.gundog-agility.co.uk Details can be found on how to join and what league tables are available. Points can be gained from KC or Independent shows and we use the dog height measurement scales from KC and UKA with some choice of cross over between the two. As we are not an actual training club, we have used our shows to get together and have found that the response and atmosphere is always fantastic. We are looking into the possibility of holding some training days over the winter of 2012, using some well known top trainers again as a get together but also to promote Gundogs in agility. We are non-profit making and at the moment only have sponsorship from Tony Wild Camping so any further ideas on sponsorship would be great. Below are the League Winner results for 2011 . The presentations for the League will take place at the Annual Awards Agility show on the 26 February 2012.